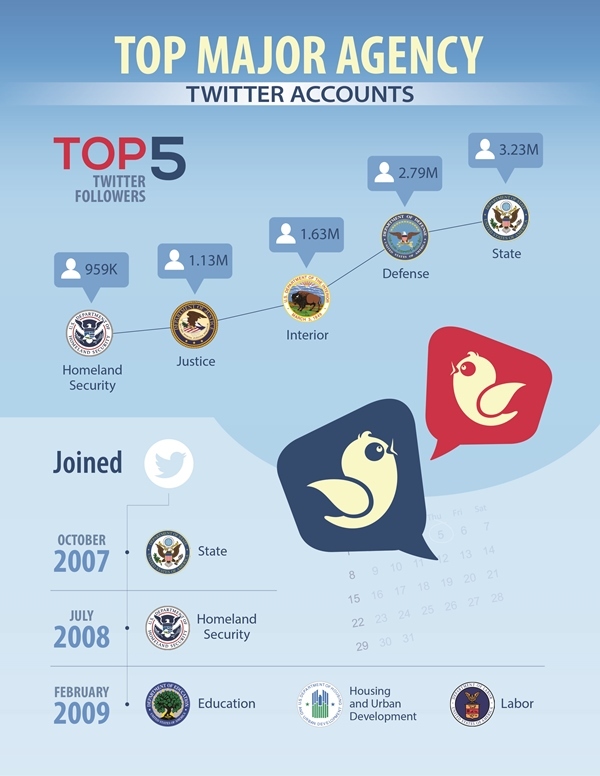 MeriTalk studied the Twitter accounts of 15 agencies to determine number of followers, number of tweets, and year that the Twitter accounts were created to determine which agencies are the most successful on the social media site. Twitter accounts that stick to the agency’s theme, put out about an equal number of retweets and original tweets, include a wide variety of original photos, engage with people outside of the Washington, D.C., area, and create a sense of immediacy in their content tend to have the most followers. Twitter accounts that mostly tweet about past events, use an increased number of infographics and stock photos, tweet to mostly to congratulate members of their own agency, tweet in text format, and mostly create content through retweets tend to have a smaller number of followers. However, the number of followers that an agency is able to accumulate isn’t always important, according to Andrew Selepak, director of the master’s program in social media at the University of Florida. Gaining followers would be important to military and law enforcement agencies that rely on the public when they tweet out information about a public emergency or a suspect at large. “That’s going to get a lot of people interested in your account immediately,” said Selepak. Agencies such as Housing and Urban Development could focus more on improving its customer service through Twitter, according to Selepak. “If your simple goal is to gain followers, the first thing to do is get people a reason to follow,” Selepak said. The State Department has realized these goals successfully by tweeting out daily press briefings, clips of statements by senior officials, and links to blogs on foreign policy in order to gain 3.2 million followers since 2007. “We realized early that this was going to be an important mechanism to engage with a broader audience,” said Cynthia Brown, acting deputy assistant secretary for digital strategy. The State Department saw a significant jump in followers in the past two years, from 1 million followers in October 2014 to more than 3 million today, and 300,000 followers of Secretary of State John Kerry’s Twitter account in October 2014 to 2 million today. The State Department is active in 13 social media platforms and is always looking forward to where its audience is moving to be able to interact with them through new media sources. In 2009, agencies had a “you build it and they will come” ideal for Twitter and Facebook. Now the State Department goes to the audience instead of waiting for them, according to Brown. “It can be difficult when you’re a large presence to respond to people individually,” Brown said. To combat this challenge, the State Department hosts Twitter chats on topics such as passports, climate change, and learning the English language in order to gauge and incorporate public opinion. The State Department differs from other agencies in that it speaks to an international audience rather than focusing only on American citizens. “We’re not going to alienate our international audience with our message,” Brown said. The agency considers the appropriate use of language and whether images are culturally sensitive whenever it posts to Twitter. The State Department has to handle issues such as the refugee crisis, conflict in Syria, and the Iran nuclear deal. “It’s a responsibility that we have to provide our followership with information that’s valuable,” Brown said.